← Second World War Veteran Ronald William GIBBINS has lost his War Medals – Can you please help? Refused a Victoria Cross in 1917, Arthur Lawrence CARSON continued to serve his adopted country and in doing so gained the unique distinction of being the only Australian soldier to receive a Distinguished Conduct Medal for his actions during the First World War, then 26 years later receive a Military Medal for his bravery on the Kokoda Trail during the Second World War. Arthur was born Arthur Loritz OLSEN at Arendal, a picturesque coastal town in the county of Aust-Agder, Southern Norway on 2 May 1893, to a single mother Tomina Juliarne, (Helen) Olsen. Helen later married Karl HENDRICKSON and had two daughters Hedvig & Karoline. Sadly Arthur and his sisters were orphaned at an early age and confined to an orphanage. 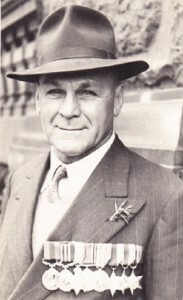 IMAGE RIGHT: Postwar photograph of Sergeant Arthur Lawrence CARSON D.C.M, M.M, M.I.D. It is interesting to note that he is not wearing his Defence Medal, 1939-1945 War Medal, his 1939-1945 Australia Service Medal nor his Greek Campaign Medal. Arthur absconded from the orphanage at the age of fourteen and signed on to a merchant ship. Intent on seeing the world, while being able to send money home to his sisters who were still at the orphanage, during his two years at sea he was impressed most by what he saw in both Australia and Brazil. While berthed in Cairns, North Queensland on 14 July 1909 he made the decision to give Australia a go as his future home and signed off the Chinese vessel, SS Changsha which had bought him from Hong Kong. Then changing his surname to CARLSON, (the son of Karl) Arthur sought employment in Cairns only to find if he wanted to get a job he needed to speak English without an accent. Moving about the country, he worked at Port Lincoln in South Australia, then Newcastle, New South Wales before finally settling in Balmain, Sydney where he worked as a ship’s painter. With the war clouds rolling over Europe, he was naturalized as a Australian citizen on 20 August 1914, by a Balmain Justice of the Peace, Robert MAHONY. Two months later on Thursday 29th of October, 1914 as the first AIF contingent was preparing to leave Albany, Western Australia, to fight in the war in Europe, Arthur enlisted as Arthur CARSON at Balmain – giving his correct age and birthplace. Medically examined he was recorded as weighing 10½ stone and having a fair complexion, blue eyes and fair hair. He nominated Helen CARSON living in Norway as his next of kin and stated his religious denomination as ‘Church of England’ when in fact it was Lutheran. Accepted as Service Number 1327 Private Arthur CARSON, he was assigned to the 2nd Reinforcements, 2nd Battalion AIF, but for an unexplained reason he was discharged prior to his Battalion’s embarkation. IMAGE LEFT: The purple over green Colour Patch of the 2nd Infantry Battalion, AIF (Australian Imperial Force). This unit, would serve throughout the Great War and was ressurrected as the 2/2nd Battalion during the Second World War. 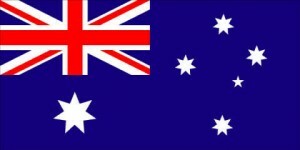 The 2/2nd Infantry Battalion would add the ‘grey border’ to this colour patch to signify the Second AIF. It is interesting to note that Arthur would fight alongside his “old” unit on the Kokoda Track, 36 years later. Four months later on 1 March 1915, Arthur enlisted again, this time stating his age as 21 year and 9 months. He enlisted as Arthur Lawrence CARLSON, a labourer, born in Cairns. He nominated Mrs P. DUMMETT the owner of a boarding house at 81 College St Balmain as his next of kin. Now serving under the number 1733, Arthur was allotted to the 4th Reinforcements of the 2nd Battalion and embarked from Sydney onboard A8 His Majesty’s Australian Transport (HMAT) Argyllshire on 10 April 1915. Two weeks after disembarking in Egypt and just two months after enlisting Arthur waded ashore at Gallipoli on 26 May, just a week after the Turks had launched their determined counter attack which is best described by the National Library of Australia web site, “Dispatches from Gallipoli”. On 19 May 1915, their German commander, Field Marshal Liman Von Sanders, sent the first of 42 000 Turkish troops to attack the 12 500 Anzacs then at Anzac Cove. The intention was to drive all Anzac forces on to the beach and kill them there. In places the combatants were only metres apart but it was one assault for which the Anzacs and their British commanders were prepared. British pilots had noticed a build up in the Turkish line, confirming observations by those on the ground, including Charles Bean, that Turkish firing patterns had changed and that heavier artillery was being used. 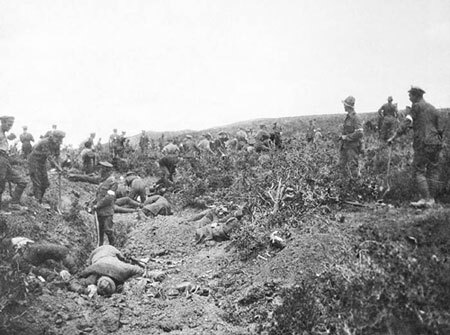 In the resulting six-hour battle, the Turks were to incur around 10 000 casualties as repeated lines of Turkish troops were sent out of their trenches, to be gunned down almost immediately by the Anzac forces; — On 24 May, an informal truce was called while both sides collected their dead and wounded. The eight-hour formal break in fighting was agreed to by the men of both sides. IMAGE RIGHT: Photograph of the truce called in the Anzac area, to bury the dead which had accumulated in “No man’s land”, particularly as a result of the major Turkish offensive on the 19th of May. This attack had failed after a six hour battle in which the Anzacs had fired an estimate of 950,000 shots at the charging Turks on whom they inflicted 10,000 casualties, 3,000 killed and 7,000 wounded. Australian Casualties that day were 160 killed 468 wounded. One man that was killed was ‘The Man with the Donkey’ Pte John Simpson KIRKPATRICK. On 31 May “Beachy Bill” a large Turkish cannon bombarded the 2nd Battalion from its position known to the Anzacs as Olive Grove. This one gun was responsible for the death of hundreds of Australian soldiers on the peninsular. Despite the best efforts of the troops from both sides during the truce, of May 24, the bodies of many of the Turks remained unburied. 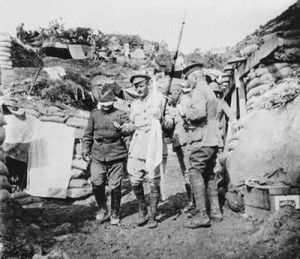 The 2nd Battalion’s position was plagued not only with the stench, but also the swarms of flies, this and the shortage of water and food caused a breakdown in the health of the men, Arthur was one of many, who severely weakened with gastritis, was sent to Lemnos for treatment in the 3rd Australian General Hospital. Concerned that leaving the line was akin to desertion, Arthur was frustrated at the decision to keep him at Lemnos for almost two months while his Battalion was engaged in the Battle for Lone Pine, where although successful – the Australians had suffered 2,000 casualties one of whom Lieutenant Colonel Robert SCOBIE, the Commander of his Battalion. In November Arthur was isolated in a hospital on Gallipoli for two weeks suffering with mumps, in a futile attempt to curb this re-occurring disease. Records show that during their last six weeks on Gallipoli, more Australians died of disease than were killed or wounded by the Turks. Arthur withdrew from Gallipoli with his Battalion on the 20th of December 1915, onboard SS Huntsgreen and disembarked at Alexandria on 28 December. The Huntsgreen was the renamed German 9,060 ton liner Derflinger, which had been captured by the British at the outbreak of hostilities. Three months later, 22nd of March 1916, following an initial rest period his Battalion was split, half of their trained and battle experienced troops were taken to form the 54th Battalion which four months later were to suffer 65% casualties at Fromelles. Arthur remained with the 2nd Battalion which embarked from Alexandria for Marseilles onboard Ivernia, a former Cunard line ship, in his newly chosen capacity as a Stretcher Bearer on 20 July. The 2nd Battalion entered the front line during a divisional attack that resulted in the capture of Pozieres on the 23rd July 1916; During an attack on a German stronghold Arthur received a gunshot wound to the buttock, “a Blighty”, (A wound serious enough to require the recipient to be sent to England). He was evacuated to the No. 2 Canadian Hospital from where he was placed onboard HS Gloucester Castle to be returned to England and admitted to the 2nd War Hospital in Birmingham on 3rd August, 1916. Although Arthur was declared fit for duty and discharged from hospital on the 28th of October 1916, it was 15 February 1917 when he returned to France from Folkestone onboard SS Victoria, and a further ten weeks before he rejoined the 2nd Battalion. Two days later, on the 4th of May as the 2nd Battalion attacked the heavily fortified Hindenburg line near Bullecourt, Arthur watched as two of his fellow stretcher bearers went out into “No Mans Land” to bring back a wounded man who was entangled in the enemy’s barbed wire. As they were carrying the man back they were fired on by German snipers and machine gunners. One, twenty year old Private Harold “Harry” Edgar RINGLAND was killed, leaving the other Corporal Granville Victor “Vic” JOHNSON alone with the seriously wounded man. Incensed at the breach of the protocol in not recognising the use of a white flag or a Red Cross, Arthur leapt from “Pioneer Trench” and zig-zagged his way through a constant stream of rifle and machine gun fire as he crossed “No Man’s Land” to Johnson’s side. Johnson, who had dragged his patient into a shell hole seeking protection from the constant fire coming in his direction from the Germans, was amazed that Arthur had survived the run from Pioneer trench. Awaiting a lull in the firing they were bringing the wounded man back to safety when several wounded sheltering in a nearby shell hole called on them for help. (The man they were rescuing was a middle aged German soldier, one of a group of prisoners captured the previous day who had been machine-gunned by the Germans as they were being escorted to the Australian line). As soon as Arthur and Vic JOHNSON got this man to safety, Arthur returned alone into “No Man’s Land” and brought in one of the wounded men. IMAGE LEFT: Gallipoli (Anzac area) on the 22nd of May, 1915. This photograph shows the blindfolded Turkish envoy, Major Kemal OHRI who has entered the Anzac lines after displaying the “white flag” of truce. 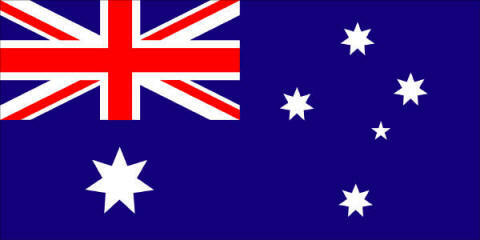 This signal is a call by one warring party, for the other to cease fire whilst a negotiation or other act, takes place. Obviously, the courtesy displayed by the Australians in this instance, was not reciprocated by the Germans when the white flag was waved by Arthur CARSON. The Australian in this photo who is escorting Major Ohri is Major Sam BUTLER. Exhausted he took a short break before he returned into “No Man’s Land”, his vigorous waving of a white flag appeared to have silenced the enemy snipers as he brought the remaining three wounded to safety. He returned into “No Man’s Land” continuing to wave his white flag as he searched for more wounded, discovering a badly wounded digger he was joined by Private James PAUL, a tall Scottish born stretcher bearer from “D” Company, as he dressed the diggers wounds. As they were carrying the digger to safety PAUL was shot in the head and killed by a sniper. Furious at the enemy machine gunners who continued to target him, Arthur, again vigorously waved his white flag till the firing ceased. With the wounded man on his shoulder, he made his way back towards his own line and almost made it before he was shot through the left thigh while his patient was again wounded. The force of the bullet knocked him into a shell hole. After a further display of his white flag silenced the snipers, he crawled back to safety dragging the wounded man behind him. Due to the severity of his wounds Arthur was evacuated to a hospital in England for treatment. The recommendation that Arthur be awarded a Victoria Cross was immediately submitted by the Scottish born Commander of the 2nd Battalion, Lieutenant-Colonel Stanley Lyndall MILLIGAN DSO. Supported by George Fredrick BRAND (7th Light Trench Mortar Battery) and Lieutenant Leslie WHARTON (“C” company of the 2nd Battalion). This recommendation was rejected on the 16th of May, 1917 with a notation attached informing MILLIGAN that the Victoria Cross would not be awarded for lifesaving. 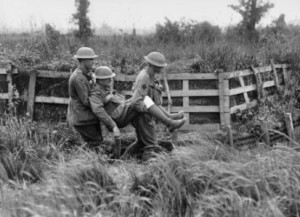 IMAGE RIGHT: An Australian casualty being carried to a Field Hospital by two of his comrades. It is confusing to understand why Arthur CARLSON (CARSON) would be refused a Victoria Cross for ‘saving life’ when the first V.C. 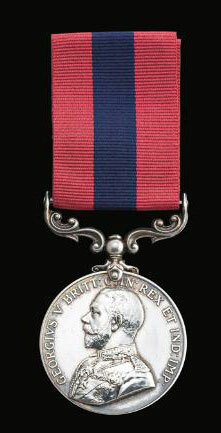 awarded to an Australian was that of Sir Neville Reginald HOWSE V.C. On the 24th of July 1900, during the action at Vredefort, South Africa, Howse (then a Captain with the N.S.W. Medical Staff Corps) saw a trumpeter fall, and went through very heavy cross-fire to rescue the man. His horse was soon shot from under him, but he continued on foot, reached the casualty, dressed his wound, and then carried him to safety. For this action, Howse was awarded the Victoria Cross. The award was gazetted on 4 June 1901 and the original citation reads: During the action at Vredefort on the 24 July, 1900, Captain House went out under a heavy cross fire and picked up a wounded man, and carried him to a place of shelter”. The Commander of the 1st Australian Infantry Brigade, Brigadier-General W. B. LESSLIE, strongly disagreed with the decision and the reason for rejecting the recommendation. He replied that in his opinion the instructions issued on the subject were not intended to debar a stretcher bearer from obtaining the Empire’s highest reward for valour. Drawing attention to the awarding of a VC to Private Christopher Augustus COX, a stretcher bearer who while serving with the 7th Battalion of the Bedfordshire Regiment, had received a VC for his rescue of the wounded at Achiet-le-Grand on 13 March 1917. When this appeal failed, a recommendation for a Distinguished Conduct Medal was submitted on 19 May by Major-General Harold WALKER of the 1st Australian Division and counter signed by Lieutenant-General Sir William BIRDWOOD, Commander, 1st Anzac Corps. The awarding of the DCM to Arthur was published in the London Gazette on the 16th of August 1917. IMAGE LEFT: The D.C.M. (Distinguished Conduct Medal) as awarded to Sergeant Arthur Lawrence CARLSON. Temporary Sergeant Henry WANSBROUGH, a former surveyor from Sydney, whom himself was in Hospital in London wrote to Arthur, after reading of the award telling him that those who witnessed his work that day believed if ever a VC was earned by anyone, he had earned it that day. WANSBROUGH went on to say he believed the fact that Bede KENNY of the 2nd Battalion had been successfully recommended for a Victoria Cross only a few weeks before, had gone against Arthur’s recommendation being accepted. In early 1917 the German Army withdrew to the formidable defences of the Hindenburg Line. As the 2nd Battalion advanced towards these defences in April 1917, Private T. J. Kenny attacked several enemy machine gun positions with grenades, earning the 2nd Battalion’s only Victoria Cross. Ironically, John William Alexander Jackson VC, of Gunbar near Hay, still the youngest Australian to be awarded the Victoria Cross, had received his award for rescuing wounded men while under heavy fire on the night of 25-26 June 1916. For most conspicuous bravery. On the return from a successful raid, several members of the raiding party were seriously wounded in No Man’s Land by shell fire. Private Jackson got back safely and, after handing over a prisoner whom he had brought in, immediately went out again under a very heavy shell fire and assisted in bringing in a wounded man. He then went out again, and with a sergeant was bringing in another wounded man, when his arm was blown off by a shell and the sergeant was rendered unconscious. He then returned to our trenches, obtained assistance, and went out again to look for his two wounded comrades. He set a splendid example of pluck and determination. His work has always been marked by the greatest coolness and bravery. Records show that while Australians received sixty four Victoria Crosses during World War One, a further seventy two recommendations were unsuccessful, being either down graded or dismissed. During his stay in hospital in England, Arthur met and fell in love with a Birmingham born volunteer worker, Emmie CORBETT who was caring for him. Returning to France on the 28th November 1917, Arthur did not rejoin his unit until the 9th of June 1918. Wounded in the hand by shrapnel, he was again hospitalised on the 20th June 1918 returning to duty on the 13th July, he was with the 2nd Battalion when the Allied Offensive commenced to the east of Amiens on the 8th of August 1918. This offensive achieved the greatest success in a single day on the Western Front, by either side causing the German Commander General Erich Ludendorff to describe it as “the blackest day for the German Army in the war”. Arthur was promoted to the rank of Corporal on the 25th of September, following the death of Cpl William FRASER. Following the Armistice on 11 November, Arthur was stationed in England where he re-contacted Emmie. Shortly after when Arthur’s proposal to Emmie was accepted, they made plans for Emmie to follow him to Australia – where they would be married and start their lives together. On the 21st of March 1919, Emmie was dockside to farewell Arthur as he and almost five hundred Australian troops boarded H.T. Kildonan Castle (a former mail ship with the Castle Line) to return to Australia. Arriving in Melbourne on the 6th of May 1919, he was discharged on 9th of July. Although Arthur applied to the Army for assistance to bring Emmie to Australia on the 7th of October 1919, it was the 15th of February 1921 before Emmie set foot on Australian soil. Arthur and Emmie were married at North Balmain later that year, with the niece of his landlady Mrs DUMMETT, who would remain a life long friend as their Bridesmaid. Arthur was working as a rigger and painter for the Hunter River Steamship Company and living with Emmie and their four children at 5 Napoleon Street Rozelle when he enlisted in the 55th Battalion of the Militia Forces on 4 February 1936 as 428569 Private Arthur CARLSON. Once again he stated that he had been born in Cairns, his records show he now weighed 11 ½ stone and had understated his age by five years. On his first day on parade an officer recognised him and he was promoted to Corporal. On the 1st of May he was further promoted to Lance Sergeant. On the 4th of February 1939, at the completion of his three year term, Arthur signed up for another three year term with the 55th Infantry Battalion, AMF. With the advent of the Second World War, Arthur who was then living with his family at 12 Napoleon Street Rozelle – enlisted into the 2nd AIF on the 3rd of November 1939 and was assigned to the 2/3rd Infantry Battalion, 16th Brigade of the 6th Division as NX5027 Acting Corporal Arthur Lawrence CARSON. The Commanding Officer of the 2/3rd was Lieutenant Colonel Vivian Theophilus ENGLAND, a World War 1 veteran, who had commanded the 55th Militia battalion. Ten days later Arthur was promoted to Acting Sergeant. Arthur took part in a farewell march through the streets of Sydney on the 4th of January 1940, before embarking for the Middle East a week later with the first troop convoy to leave Australia during World War 2. Disembarking at El Kantara, on the 14th of February he entered a training camp at Julis in Palestine. With Italy not yet in the war and France an active ally with a large number of troops in North Africa and Syria the AIF intended to train in Palestine before moving to France in the spring of 1941. On the 6th of April Arthur was demoted to the rank of private by his platoon commander; who whilst on the boat to Palestine had approached Arthur, asking him to keep an eye on the other soldiers and inform him of any of their misdoings!! Arthur refused, hence this demotion. On the 10th of June when Italy declared War on England; Arthur sensed that the training of the last four months was soon to be put to the test. On the 29th of June he was promoted to Lance Sergeant by Lieutenant Colonel ENGLAND, after he learnt the facts relating to Arthur’s demotion. 20th August 1940 while still at Julis, Arthur was hospitalised with Gastro Enteritis. While in hospital he learnt that due to a belief that the Italian troops based in Libya would invade Egypt; his Battalion was to move to Egypt in September to undergo intensive desert training and skills needed to replace the skilled men who with their equipment had been sent to England while they had been at Julis. It was due to the insistence of General BLAMEY that additional men and equipment were sent from Australia, while a number of key personnel were returned from England. During the last half of 1940 the AIF presence in the Middle East had trebled. Arthur again unwell, was hospitalised on Christmas day 1940 and spent the next month being treated in several facilities including a hospital ship and the 41st Scottish General Hospital. While Arthur was in Hospital on the 3rd of January 1941, the 2/3rd Battalion took part in Australia’s first major battle when it attacked the Italian’s major military outpost in the north of Libya – Bardia. During the battle that commenced at dawn on the 3rd of January, 45,000 Italians surrendered before the fighting ceased late in the afternoon of the 4th of January. The 2/3rd Battalion suffered 61 casualties, five officers and 56 other ranks. Advancing to the naval outpost of Tobruk the 16th Brigade attacked at dawn on the 21 January 1941 with the 2/3rd breaching the Italian defences before the 2/1st passed through their position. They then moved to the west of Tobruk where they captured several Italian outposts. Following the capture of the town, another 27,000 Italian troops surrendered. The 2/3rd who had suffered 57 casualties, seven officers and 50 other ranks, garrisoned Tobruk. The Australian Prime Minister, Robert MENZIES was in London in February 1941 when he was consulted on the proposed use of the 6th and 7th Australian Divisions in Greece who were facing the prospect of an invasion by troops from Germany, Italy and Bulgaria. The Greek Army had soundly thrashed the Italians who had invaded Greece in October 1940, but now Germany and Bulgaria were planning to join the Italians in another attack. MENZIES willingly offered Australian troops to fight in Greece, and in the two weeks before the Australians arrived, when the situation in Greece seriously deteriorated – he requested a re-examination of the plan. CHURCHILL, determined to go ahead, told MENZIES that General Sir Archibald WAVELL the British Commander in Chief in the Middle East, General Sir Thomas Albert BLAMEY and Major General Bernard Cyril FREYBERG VC, the Australian and New Zealand Commanders all supported the deployment. Arthur, cleared to return to his unit on the 10th of March sailed to Greece to re-join his Battalion on the 18th of March, 1941. As they were deployed north to face the anticipated attack by the German forces they were stationed at Veria. Their first action against the Germans was at Pinios Gorge, on 18 April where the 2/3rd and 2/2nd halted the German advance through the Gorge enabling the safe withdrawal by the allied forces to the south. During his time in Greece, Arthur was observed while in full view of the enemy running along the line yelling out to his fellow soldiers “come on you sons of Anzacs fight…” this and other similar encounters he survived, earned him the nickname the “Holy Ghost”. First reported wounded in action it was later confirmed that Arthur had been involved in a motor vehicle accident that occurred when the Battalion was evacuating Greece on 19 April, Arthur was in one of the last trucks attempting to leave, when it overturned. With no time to examine him further; an obviously broken finger on his left was strapped to his other fingers, following treatment at the 7th British General Hospital Crete he was returned to Egypt. At the end of April, the British forces including the Australians who had suffered nearly 3,000 casualties were withdrawn from Greece and evacuated to Crete. In June of 1941, Arthur rejoined the 2/3rd who saw action in Damascus, Syria and Lebanon, before being assigned to garrison Syria, on the 4th of August. Arthur, suffering diarrhoea, was admitted to the 2/4th Field Ambulance for seven days. When Australia declared war on Japan on the 9th of December 1941, following the surprise attack by the Japanese on Pearl Harbour; Australia’s newly elected Prime Minister, John CURTIN, ordered the 6th and 7th Divisions of the AIF, to return to Australia. This move was opposed by Churchill as the Australian troops in the Middle East grew uneasy about the safety of their families in Australia. Arthur said that news of the 19th of February 1942, air attack by the Japanese on Darwin when 242 Japanese planes dropped more bombs on Darwin than they had on Pearl Harbour, brought threats of mutiny from the Australian troops if they were not allowed to return to Australia to fight the Japanese. Their frustration doubled when they were told that Churchill was prepared to let the Japanese occupy Australia down as far as the mythical “Brisbane line”. The 6th and 7th Divisions began to leave the Middle East to face the Japanese threat in the Pacific. Arthur embarked with his Battalion on 10 March 1942; however, CHURCHILL ignored CURTIN and diverted two brigades of the 6th Division the 16th and 17th to Ceylon (now Sri Lanka). These troops disembarked on the 27th of March, told they were to defend Ceylon if it was attacked by the Japanese. Colombo was bombed by a Japanese carrier group on the 5th of April. The 2/3rd manned anti-aircraft stations, built defensive positions and in preparation for fighting in the Pacific undertook jungle training while in Ceylon. Arthur was promoted to Sergeant, then following the arrival of British Forces from India the 2/3rd left Ceylon on the 8th of July and arrived in Melbourne on the 7th of August 1942. Disembarking the following day Arthur was granted two weeks home leave. Following jungle training on the Atherton Tablelands in Queensland the 2/3rd embarked from Brisbane on the 13th of September, 1942. Arthur now 49 years of age, a veteran of Gallipoli, France, the Middle East and Greece disembarked at Port Moresby and prepared himself for the walk across the Owen Stanley Range on the Kokoda track. While traversing the track Arthur, now a Sergeant, not only carried his own pack – but that of another man who was having difficulties with the climb. Many years later, Arthur supported this man when he applied for a disability pension. At Eora Creek, (a creek which runs almost parallel to the Kokoda Trail from Myola and Kokoda, the trail crosses the creek at two points: at Templeton’s Crossing and north of the village of Eora Creek.) (*PLEASE SEE FOOTNOTE*) The 2/3rd Battalion, while seeking a way around the Japanese flanks suffered significant casualties. Arthur and his party of bearers had successfully brought several of the wounded from Eora village to an aid station while under heavy mortar and machine gun fire. As they prepared to return to the village they were told volunteers were being sought to evacuate a seriously wounded man who was in need treatment beyond those available at the aid station. Despite being warned by officers that the task would be particularly dangerous, Arthur and his party volunteered to evacuate the soldier to the 2/1st Battalion Regimental Aid Post. IMAGE LEFT: The hut area at Eora Creek in what is commonly referred to as ‘Eora Creek Village’. This photo was taken circa 31st August, 1942 when the Australians were withdrawing through this position after the battle for Isurava Rest House. This is the area which author Lex McAULAY refers to, when he makes mention of Arthur. On page 336 McAULAY writes:- Just before the track reached Eora Creek crossing, it followed a naked, open spur as it descended. The spur came to an abrupt end then went down steeply to the village itself some 100 yards below. 2/3rd Battalion came under fire from mortars and machineguns positioned on the muntain slope across the creek. (It goes on to say) This platoon was led by Sergeant Arthur CARSON, who was then about 50 years old and who had won the Distinguished Conduct Medal in 1917 as a stretcher bearer at Bullecourt. Almost immediately they were fired on by Japanese manning heavy and light machine guns. With one of his party already killed and another wounded, Arthur knew he was in trouble and needed more bearers if the party was to successfully take this man to the aid post or in fact survive. Finding cover for his party he made his way alone up the steep mountain path while under constant heavy enemy fire. Upon reaching headquarters he quickly organized a group of volunteers and led them back to his party. Consolidating them he led the party to the Aid Post through the continuing enemy fire. His citation states that his courage and coolness, while under fire was an outstanding example to all who witnessed his action. Ninety-nine Australians were killed in the battle of Eora Creek and another 192 including Arthur were wounded. The 2/3rd Battalion then became involved in the fighting at Oivi and on the Sanananda Track. In December the 16th Brigad, had less than 1,000 men fit for duty. When they were relieved by the 30th Brigade, the 2/3rd had been reduced to 6 Officers and 67 men of other ranks. IMAGE RIGHT: Australian troops wade through the swampy ground which surrounds the Sanananda Track. 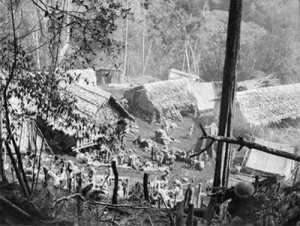 Whilst the unit in this photograph is believed to be the 7th Division Cavalry Regiment (fighting dismounted), this mosquito infested and waterlogged terrain is typical of the jungle which all units experienced during the Sanananda campaign. It is little wonder that so many men – suffered the effects of Malaria and Dengue Fever. Arthur who now suffered Mortar Deafness, was placed in charge of supplies especially the “grog” at the Kokoda airstrip. A smart move by those who knew Arthur never drank or smoked. The 2/3rd Battalion were flown back to Port Moresby on the 23rd of December 1942, from where with their sick and wounded comrades they were returned to Australia for leave and further medical treatment. It was to be almost a year before all the sick and wounded returned to the Battalion, now stationed on the Atherton Tablelands. They were later joined by reinforcements needed to bring the 2/3rd back to full strength. Arthur was returned to the battalion on the 2nd of March 1943. The London Gazette of 23 December 1943, revealed Arthur had been mentioned in dispatches for gallantry and distinguished service in the South West Pacific area. 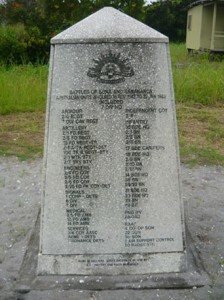 IMAGE LEFT: War Memorial which stands near the waterline at Buna in New Guinea. This monolith stands just north of the area which was known as “Buna Mission” and south of Giropa Point. It commemorates all of the units which fought in the Sanananda/Buna area. Of note is the fact that Arthur’s Second World War unit is alongside his ‘First World War’ unit, being the 2nd Battalion. In June, the Army records office started questioning if Sgt Arthur CARLSON from 1914-1919 and Corporal Arthur CARSON from 1939-1945 were the same man? And on the 7th of October transferred Arthur to the 16th Australian Training Battalion. The Military Medal for his action at Eora Creek appeared in the London Gazette on 27 April 1944. On the 16th of August 1945, Arthur now 51 years of age, was transferred to a recruiting depot and discharged two weeks later. He had served in Palestine, North Africa, Greece, Crete and Papua New Guinea. The 2/3rd Battalion was one of only two Australian infantry battalions to fight against the Germans, Italians, Japanese and Vichy French during the war. The Governor of NSW, Lieutenant General John NORTHCOTT CB MVO, presented Arthur with his Military Medal at Government House, Sydney on the 26th of February 1947. IMAGE RIGHT: The portrait of Sergeant Arthur Lawrence CARSON, painted by reknown war artist Harold ABBOTT in 1956. Note his unit colour patch and ribbon bar, denoting his multiple awards. In August 1951, Arthur returned his 1939-1945 Star, Africa Star and Pacific Star to the army to have them inscribed but the medals were lost in transit. 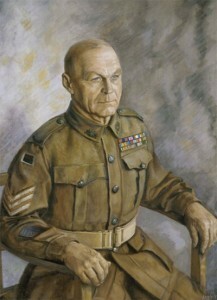 In 1952 he was awarded the Efficiency Medal and then in 1956 his portrait was painted in Sydney by Harold ABBOTT, the 1940 winner of the Sulman prize and an official war artist between 1943 and 1945. After the war ended Arthur (pictured at an ANZAC Day March) needed to get back into the workforce and to life in general. He missed the Army life but made the best of what life had to offer. He worked for Atlantic Oil as a painter and often commented that life would have been different if he had been awarded a VC. When he retired, Arthur purchased a property at Killcare overlooking the Brisbane Waters and with Emmie settled down to enjoy their grandchildren. Memories of his service and the battles he had been engaged in remained with him and every evening wherever he was, he would go for a walk and reflect on this aspect of his life. On the 17th of March 1967, the Australian Prime Minister, the Rt Hon Harold HOLT informed the House of Representatives that arrangements for the production of a Anzac Commemorative Medallion which had been first announced by the Minister for Defence in March 1966 had been finalised. On 13 June 1967, while still living at 13 Killcare Road Killcare, near Gosford, Arthur CARSON applied for his Gallipoli Medallion and Badge. Arthur was a keen and successful lottery ticket buyer winning the major prize on two occasions. After several years he sold Killcare and when Emmie died in 1968, Arthur, 76 and still fit and adventurous, wanted to return home to Norway to see his sister Hedvig, who he had not seen for more than 60 years. Their younger sister Karoline had died during World War Two under suspicious circumstances during the German occupation of Norway. With the help of his daughter, Joan who handled his travel arrangements, he returned to Norway in 1972. Arthur who had forgotten the Norwegian language and Hedvig who spoke only Norwegian laughed at their difficulty in conversing but cherished every moment of the month they spent together visiting places Arthur could remember. So much so that Arthur returned to Norway for another holiday two years later. Returning to Australia, he moved into the Narrabeen War Veterans Home where he was still assisting fellow veterans with their problems, when Joan visited him in 1978 and sadly told him of Hedvig’s death. After hearing this, Arthur, now aged 85 years slowly declined, he died on the 26th June 1979. He was privately cremated at Woronora Crematorium two days later, his ashes in WPC/2/0037 are identified by a plaque that reveals nothing to the passer by of this man’s outstanding bravery and his awards. His medals were the DCM (George V). Military Medal (George V1). 1914/15 Star 7523. British War Medal 9456. Victory Medal 9268. 1939/45 Star. Africa Star. Pacific Star. Defence Medal and the War Medal 1939-1945 with MID Oak leaf. Australia Service Medal 1939-1945. Efficiency Medal (George V1). Greek Medal. (The Greek Government Medal for operational service in Greek Campaign 1940-1941. IMAGE ABOVE: The Medal Entitlement of Sergeant Arthur Lawrence CARSON. THIS STORY HAS BEEN COMPOSED BY © Harry Willey – January 2011. Assistance was given in writing this story by Arthur’s daughter Joan, Jullee, his granddaughter. Rolf-Gunnar Jacobson, a grandson of Hedvig, and Darryl Kelly OAM a serving Army Officer, Author of “Close………But Not Close Enough. 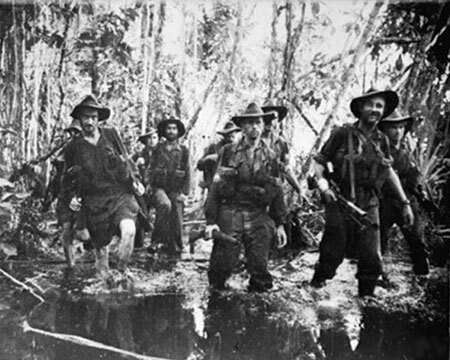 (FOOTNOTE: In relation to the author’s comments regarding Eora Creek “runs almost parallel to the Kokoda Trail from Myola and Kokoda, the trail crosses the creek at two points: at Templeton’s Crossing and north of the village of Eora Creek” he is relating to the original ‘Mail Trail’ which formed the main track prior to the Kokoda Campaign. It is known that Kokoda stalwart, Herbert “Bert” KIENZLE cut a new track from Templeton’s Crossing, back to Myola when this area was opened up as a supply point. As a result, a ‘third’ crossing was created over Eora Creek at “Dump 1” and modern day trekkers take this route.) Information: Soc Kienzle (son of Bert Kienzle). DO YOU WISH TO WALK THE BATTLEFIELDS OF GALLIPOLI? OR HEAR FIRST HAND – THE ACCOUNTS OF THE 2/3rd BATTALION AND OTHER UNITS ON THE KOKODA TRACK AND AT SANANANDA? IF SO, PLEASE CONTACT THE MEDALS GONE MISSING ADMINISTRATOR OR Click Here. Medals Gone Missing Administrator Gary Traynor conducts Battlefield Tours of Gallipoli. He also is a leader in the field of Battlefield Tours to the Beach heads of Buna, Gona & Sanananda. If you are a member of the ADF – you may be interested to know that serving army officer, Darryl KELLY also conducts extensive tours of the Gallipoli Battlefield and runs a program for leading N.C.O’s . Please contact us for futher details. This entry was posted in Gallipoli, Honour Roll - Australian Stories, Military Medals and tagged Gallipoli - Turkey, Kokoda Track. Bookmark the permalink.